In the early 60s Mom had 3 small girls and was the leader of a troop of Brownie Scouts. My mother was a sucker for holidays, and she loved Halloween. From personally answering the door with big bowls of apples and candy (both ‘good’ and ‘bad’ treats) she progressed to dressing up as a witch in cape and hat. We had a Walt Disney ”Chilling, Thrilling Sounds of the Haunted House” record that played over and over in the background. Mom began to dye her face and hands a rather convincing green. She perfected a witch’s cackle and would slowly open the front door to a dark living room. The yarn cobwebs and paper skeletons hanging from the ceiling then became visible in the lights from the candles. Needless to say, our house became cult. Little kids (and their parents, who discovered it had to be seen to be believed) saved our house for last to visit on the trick-or-trick circuit. We ended up having to buy lots more apples and candies every year as the number of visitors grew. Mom was always slightly hoarse and had a sickly green-y pallor for days after that holiday. Green food coloring does not wash off easily…. I wish I had some pictures from those days but this one will have to suffice. 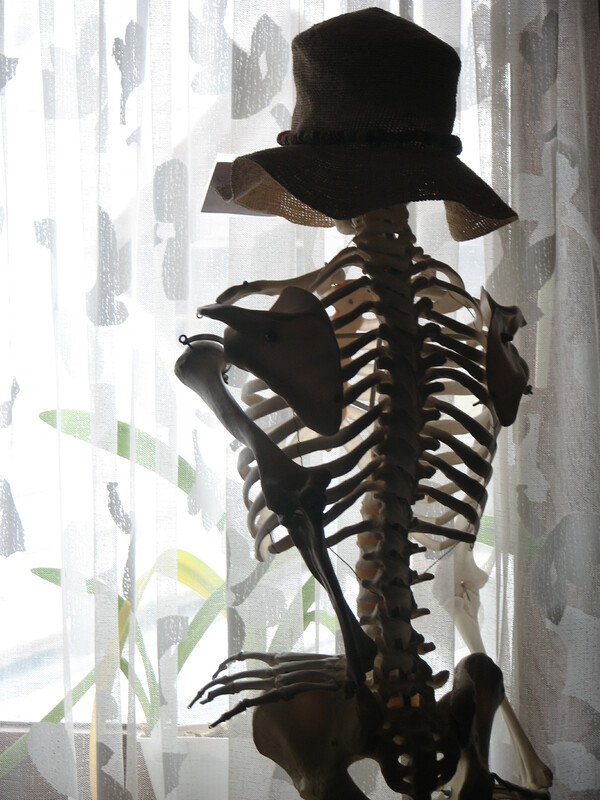 As a massage therapist I have a (not-real) skeleton standing in my treatment room as a visual aide. Each year on October 31st I set him in a window backlit by candles, to honor my mother and all the dead.